It's safe to say that we all need a sharp pick-me-up for these Monday mornings. Why not start with your outfit? Bold pops of red have a way of boosting my confidence when it comes to style. Fortunately, Miche reached out to me at the perfect time with their fun and functional bags. 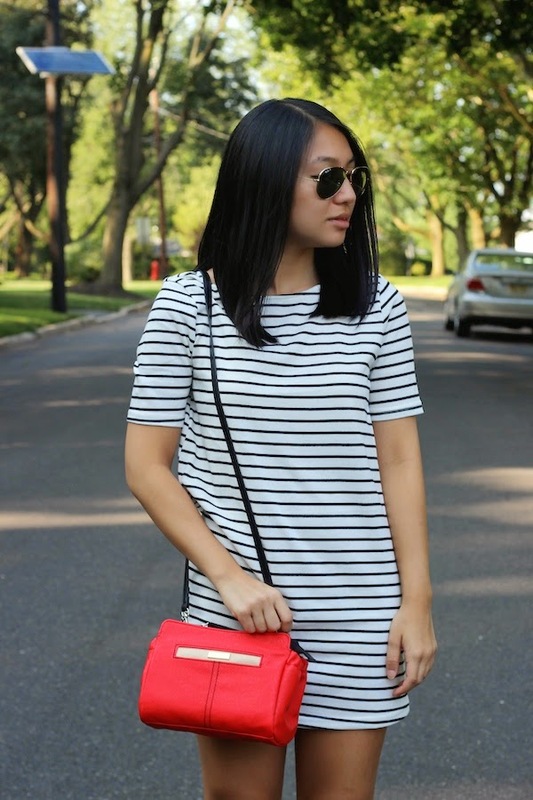 I had been looking for a red bag for a while, and I love how this one comes as a mini crossbody for a more subtle statement. If you watched my most recent video, you'll know that I had been searching for a basic striped shift dress for a while. This is a closet staple because it can be worn all year round and for various occasions. It can be taken from day to night, from work to the weekend. I decided to pair this dress with my red accessories to create a balance between simple and statement pieces. The result is a look that is ready for the work or school week ahead. Here's to a happy Monday! Agreed! Thank you, have a great week as well! Totally interchangeable is TOTALLY COOL!! The color combo is so great. Can I get a mini review on the Windsor dress, please? I've never shopped from them and I'm looking at the more body-con version of their striped dresses. Are they good quality? Do you find they run true to size? Thanks! Sure! I'll leave another review on your blog tomorrow because you may not see this reply haha. The dress is actually great quality. It's a nice thick knit and it fit me perfectly! You can never go wrong with stripes and red, great choice. Cute dress! Love the pop of red! The dress is so simple but still looks so good! Anw i love ur blog! Thank you!! I'll definitely check out yours as well! I love your outfits Christina! And totally agree with you a good way to feel better monday morning is in an outfit you can feel confident about! 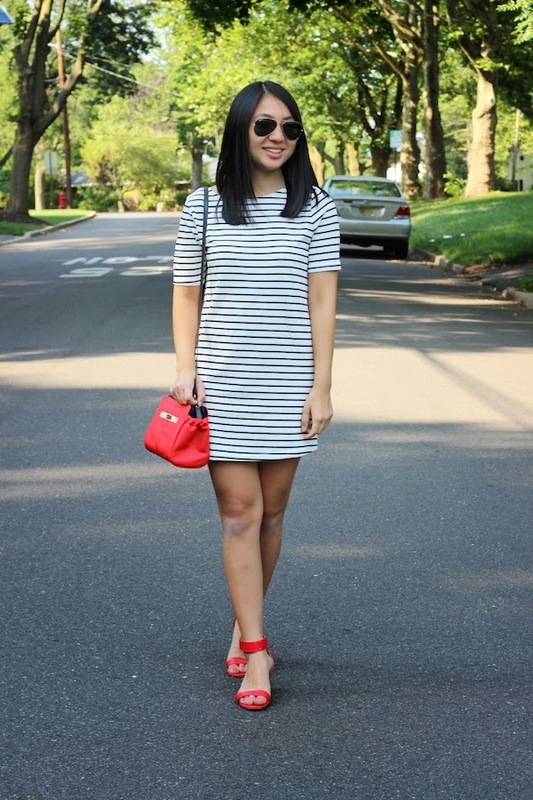 The pop of red is super stylish and I love anything with stripes! You are always so sweet, Kylie! Thank you! Great outfit! I love stripes with red!! Red is my favorite color so I'm definitely loving the pops of red, great outfit! I absolutely LOVE red and it looks great with your cute dress! Love the red accents, Christina! I love how you style all your outfits! So chic and adorable! Love the look!